Click on an image below to choose from our huge selection of styles and colors. 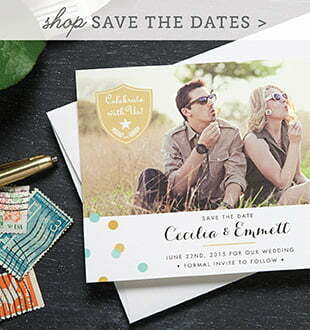 “ We had shopped around for invitations and we found these perfect invites. We couldn't be happier with them! They even offered complimentary envelopes with our return address on them! We highly recommend using Evermine, they are fast, affordable and perfect! “ — Kristine A. 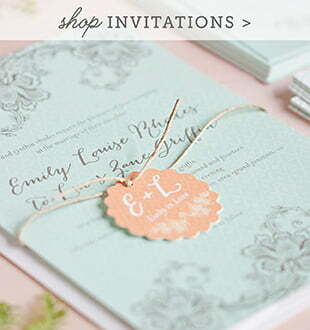 Our classic invitations are printed on thick, luxurious, softly textured paper. Digital offset printing provides rich, warm colors and clear, sharp images. Your images will be edited by an expert photo stylist to make them look the best possible, and your text will be styled by an expert type designer to make your invitation look balanced and beautiful. Paper is archival quality and acid-free (this means the paper will not yellow with age). Paper is 30% recycled, made using wind power. Invitations and paper are entirely made in the USA. You can personalize the note cards and place cards with your own monogram or name. 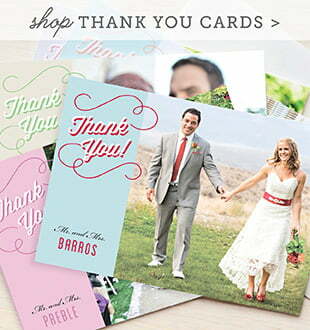 Choose from our styles and colors to create your own personalized notecards and placecards. Ordering is fast and easy, and you can order just the amount you need. Our personalized note cards and custom place cards are designed to match the styles and colors of our labels, favor tags and coasters, and you can expect the same exacting quality and individual typographic styling as you get on all of our products. The notecards and placecards are personalized with your monogram or name, and are printed in color on one side. Personalized note cards are perfect for thank you cards, greeting cards, save the date cards, invitations, announcements, and stationery for business & personal letter writing. This boxed stationery set includes deluxe foldover note cards which are blank inside and come with matching envelopes, and matching return address stickers can also be ordered. Small, clear return address labels and designer address labels are also available.